A medium-sized hunting dog that originated in Hungary, the vizsla has a devoted following of both hunters and conformation enthusiasts. While they are essentially pointers – locking up on game and indicating its location by pointing with their nose – they do have an inherent desire to retrieve as well. If introduced to water and encouraged to work in it, they can make passably retrieve waterfowl in many settings. Perhaps the most recognizable feature of the vizsla is its coloring; shading of solid rust gives it a very distinctive look. The coat is short, flat and dense without an undercoat. They are medium in size, standing a strict 21 to 24 inches in height at the shoulder and run 40 to 65 pounds, with females being slightly smaller. While they are lightly built to withstand the rigors of the hunt, vizslas are robust and well muscled – even sinewy. Agile and energetic, they were bred to hunt the fields, forests and waters of Hungary with power, drive and endurance. That being said, they are “people” dogs and make one of the best family companions of all the pointing breeds. According to the AKC, the vizsla's ancestors were hunters and companions for the Magyar hordes, a tribe that settled in what is now known as Hungary. They lived in the Carpathian Basin during the 10th Century, and their stone etchings dating to more than 1,000 years ago depict hunters using falcons and vizsla-like dogs. The first written account of vizslas is from 1357 by the Carmelite Friars on order of King Louis the Great. Upon the establishment of a definitive type descending from the Magyar hunting dogs, vizsla lines were bred and jealously protected by the barons and land-owning aristocracy of the Hungary area. That high esteem and development of the breed allowed vizslas to survive many historic episodes that might have caused it to go extinct – including nearly two hundred years of Turkish occupation, a revolution, World War I and II and time under Soviet control (where many purebred dogs lacked papers and registration). While the world wars pushed many breeds to the edge of extinction, it also offered a time of increased awareness and dispersion. The breed was brought to the US at the close of the second world war, and its popularity began to climb. It was recognized as an AKC breed in 1960. As hunting dogs, vizslas are energetic, intelligent and possess a good nose. They take to training readily, especially if delivered in a gentle but firm and consistent manner. They thrive on attention and want to be near their owners. Properly socialized, they are fine around children and other pets. The average lifespan of viszlas tends to be about 9 to 10 years, with some going much older. Various cancers are probably the largest threat to vizsla health, although epilepsy, food allergies, hypothyroidism, dwarfism, progressive retinal atrophy and heart issues can affect them, too. 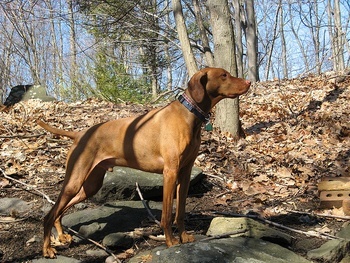 For hunters, exercise-induced collapse is a genetic neurological disorder that can affect the vizsla. The debilitating disease will keep a hunting dog from performing its duties. Paw Print Genetics tests vizslas for exercise-induced collapse, and if you’re considering buying a puppy or started dog for hunting purposes, you should have it or its parents screened for the disease prior to purchase.